Gail Brodholt is a leading painter and printmaker of contemporary urban landscapes. She is a Fellow of the Royal Society of Painter-Printmakers (RE). She was born in South London to immigrant parents, her father Norwegian and her mother from Trinidad. “I suppose what I’m really interested in is those unconsidered and unnoticed places that people pass through. They are on their way to somewhere else, presumably more important – on the escalators, on the tube, train station platforms, motorways…. Gail is both a painter and a printmaker and finds that working in one medium informs and enhances the other. She has published two lithographs in collaboration with the Curwen Studio. 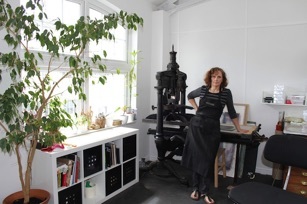 She currently holds the post of Honorary Curator of the Royal Society of Painter Printmakers.